JERICHO, N.Y. (June 25, 2018) – Just five players carded sub-par scores Monday in the opening round of the 63rd Ike MGA Stroke Play Championship Presented by Callaway, with Sam Bernstein of Century leading the field behind a 3-under-par 68 at Meadow Brook Club. Reigning Met Amateur champion Matt Mattare of Darlington and Chris Gotterup of Rumson added rounds of 2-under-par 69 while Colin Dolph of North Hempstead and Ethan Ng of Knickerbocker rounded out those in red figures with 1-under-par 70s. Bernstein offset an early bogey on the par-four 3rd with a tap-in birdie on the fifth, having nearly holed his chip on the drivable par-four. After five consecutive pars, Bernstein scored another tap-in birdie, then holed a pitching wedge from 147 yards on the par-four 12th. Bernstein, 26, closed with six consecutive pars for his 68, leaning on his flat stick down the stretch. “My putting usually propels me and I made a few nice par putts coming in,” said Bernstein. Solid approach shots also proved key for Bernstein, who hit 17 of 18 greens in regulation, then used a defensive mindset on Meadow Brook’s quick greens. Similar to Bernstein, Mattare hasn’t been able to fit in as many rounds as he’d like early in the season, but is pleased with where his game stands. “I’m certainly thrilled with how today went and hopefully it’s a springboard for tomorrow,” he said. Following a strong first year of collegiate competition, Gotterup is armed with a boosted poise for the summer. “It gave me some self-confidence that I could play with those type of guys,” said Gotterup of his season of Big 10 golf. Ryan Davis of New Jersey National, Justin Lane of Woodstock, Zach Grossman of South Fork and MGA eClub – Hudson Valley member Cody Cox all finished at even-par 71 to stand in the middle of contention heading into Tuesday. Grossman matched Mattare with six birdies in the round. Brad Tilley of Sleepy Hollow—who claimed the Ike in 2003 at Meadow Brook—Jay Card of Gardiner’s Bay, and Sam Goldenring of Brooklake rounded out those in the top 10 following day one, posting 1-over 72s. 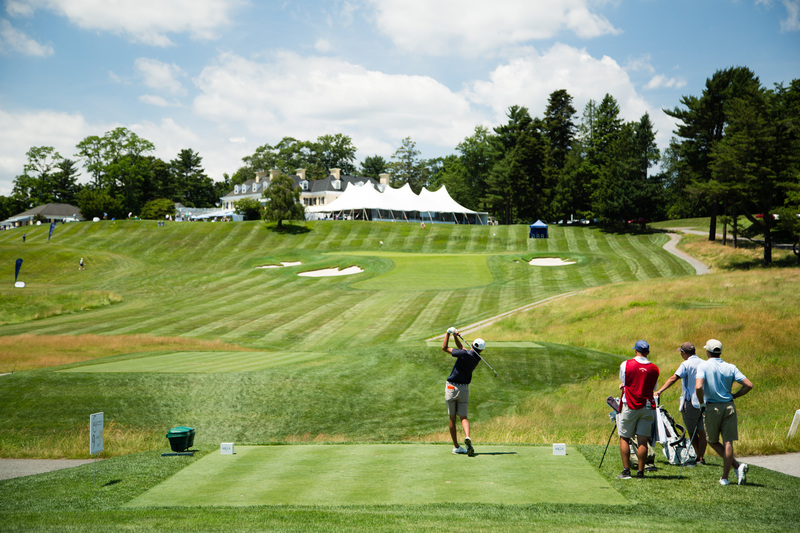 Players raved about Meadow Brook’s layout and conditioning. The club finalized a Brian Silva renovation in early 2017, with updates including new tees, rebuilt bunkers and softened doglegs. The club is one of 16 Met Area clubs to have hosted all three of the MGA’s majors—the Ike, Amateur, and Open—last hosting the Open in 2007. After Monday’s 18 holes of play, a cut was made to the low 40 scores and ties, with 49 players advancing to Tuesday’s 36 holes with scores of 5-over 76 or better. Tuesday’s starting times begin at 7:30 a.m. The second round will feature 9- and 18-hole scores, while the final round in the afternoon will include live scoring for the majority of groups.